The ROM’s first exhibition celebrating its Mexican collection is open through May 2016: ¡Viva Mexico! Clothing & Culture. The exhibition includes around 150 pieces spanning 300 years. 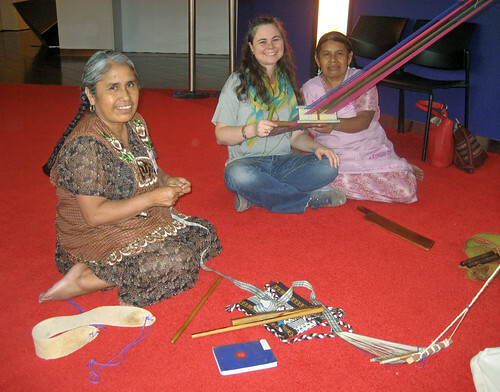 This May the Museum hosted master backstrap weavers, Crispina & Margarita Navarro Gómez as a complement to the exhibit. I visited on May 19th, and was able to meet the artists-in-residence as they demonstrated outside of the gallery. Curator, Chloë Sayer, spoke with me & also helped with translation since I do not speak Spanish. With her help, I asked the sisters questions about their work, and home in Santo Tomás Jalieza, Oaxaca state. I learned that the sisters do not typically spin but use mill-spun threads, and are of the Zapotec culture. It was also fun for my part to show a little spinning of East Friesian wool roving on my vintage Andean low-whorl spindle. 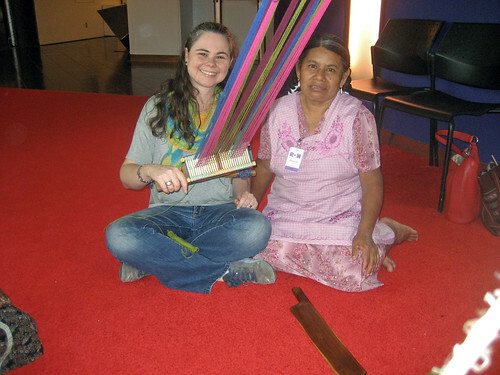 Luckily, it was still quiet when I got back after lunch with N. A very nice docent was helpful for other visitors, and Margarita helped me into weaving on the demonstration loom. The machete was so smooth, and effective with its handle but I kept wanting to use it blade-down (wrong way!). Margarita also helped me get used to the loom’s rigid heddle, and then also wove a flower motif with me strapped-in. Crispina had just finished weaving her band with fine threads. As soon as she threw the last pick, she set about braiding the first ends. It was a truly beautiful band, and she just continued straight into the next step while Margarita worked with me. 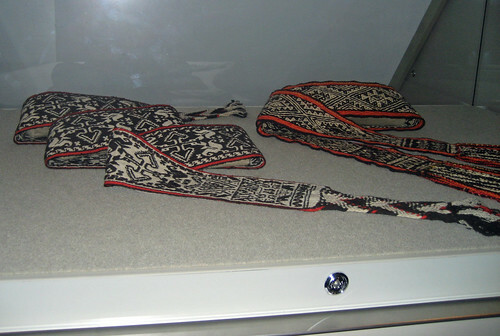 There are so many beautiful backstrap-woven pieces on display, and many are natural dyed as well. 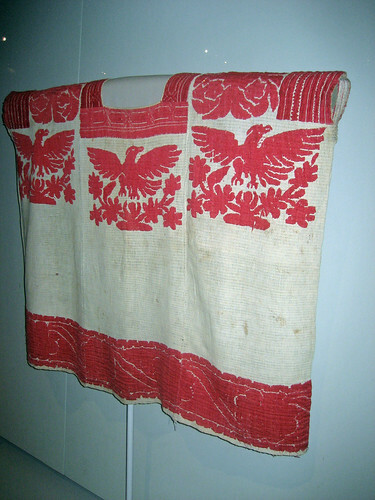 The main design motif of this huipil (1875 – 1899) is embroidered on the tabby & gauze handspun cotton fabric. The exhibit says this strong eagle resting on nopal (Opuntia cacti) motif represents the founding of Aztec culture in post-revolution Mexico. 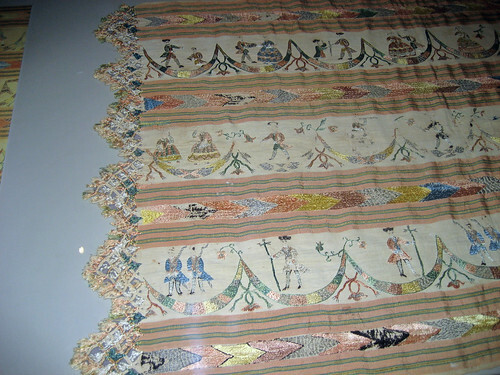 The exhibit is in the Patricia Harris Gallery of Textiles & Costume on level 4 of the new wing. I’d love to go for another visit, and gain more understanding. 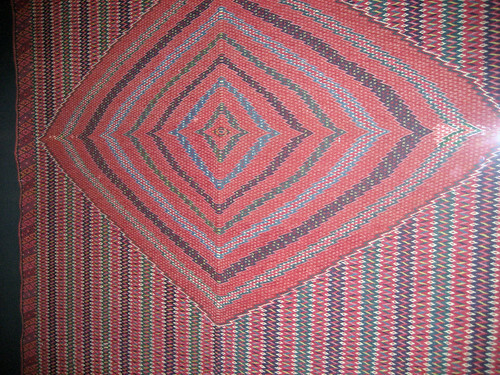 A few more pictures are up in my Flickr album, and I recommend it for anyone who is interested in Mexico’s material culture, and innovative textile production, generally. Sometimes the best obligations are those we set for ourselves. 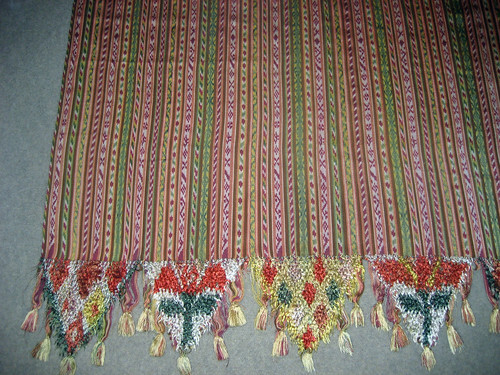 The ice-breaker into weaving again was a table runner for our front hall. 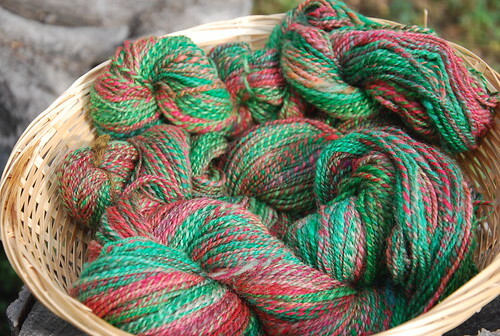 This was approximately 502 yards (1,004 yards per pound) of BFL from top that Waterloo Wools dyed as ‘Holly and Ivy’. It was a quick spin in mid-September on the antique Nova Scotia McDonald wheel, and plied on my Watson Martha also in double-drive. 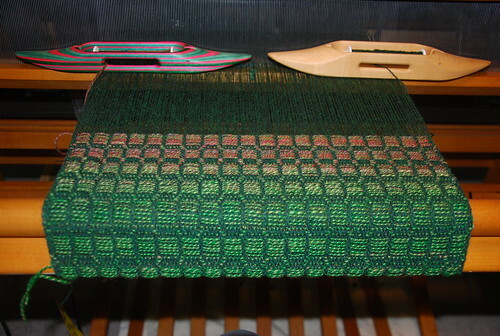 The warp & tabby weft are Harrisville’s #9 evergreen in Shetland. 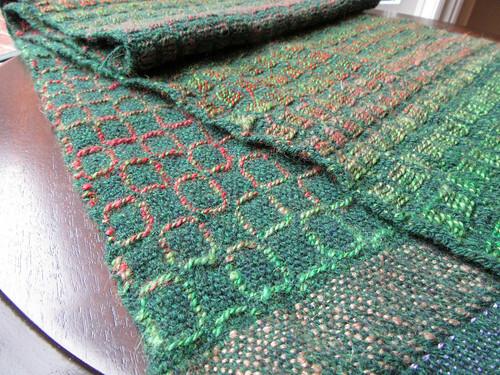 It is 1,800 yards per pound, and I used a 15 epi sett estimating for plain weave. The pattern is in Marguerite Davison’s “A Handweaver’s Pattern Book,” p. 120 I. We had a flip-through, and when N strongly preferred this Elizabeth-Jane’s design, I got to figure things out. You’ll have to take my word for it due to poor lighting at the moment – the hemmed, and pressed runner is now rocking our hall’s vintage Singer sewing machine. Holiday cheer is unlocked! It was 15″ in the reed, and with my wet finishing is fulled to 13″ width and 46″ length. 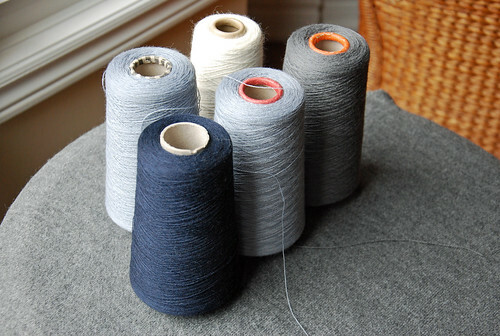 The hem’s weft was a flourish of handspun that was already on a bobbin. These cones of mill-end yarn arrived, yesterday. With lots of holiday & new baby knitting ahead, I also get to look forward to keeping my Mighty Wolf open for business! Categories: Spinning, Stash in; Stash out, Weaving | Tags: backstrap weaving, handspun yarn, Mexican weaving, table runner, textiles | Permalink.